President Robert Mugabe, sprightly and smiling, welcomed the European Union delegation "with open arms and great expectations" to State House, near the centre of Harare. Two stuffed lions observed proceedings from either side of the red carpet. This is the first such visit by the EU in seven years - and there is much talk here of "thawing" and "icebreaking" and, in the words of one European official, "re-injecting dynamism into the relationship". But behind the optimistic talk looms a mountain of scepticism and mistrust. President Mugabe made it clear his priority was the lifting of targeted EU sanctions against him and more than 200 of his political allies and related businesses. He and his Zanu-PF party have for years loudly argued that these measures are directly responsible for Zimbabwe's economic collapse. But the EU does not buy that argument, and is not even putting the sanctions issue on the negotiating table at this stage. 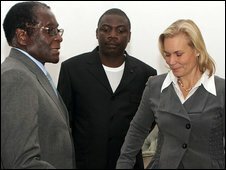 Instead, the delegation - led by Sweden's International Development Minister Gunilla Carlsson and Karel De Gucht, Europe's Commissioner for Development and Humanitarian Aid - focused on their concerns about the power-sharing agreement between Mr Mugabe and his political rivals from the Movement for Democratic Change (MDC). The deal, known as the Global Political Agreement (GPA), is a year old now. But Zanu-PF's commitment remains in question. Economically, Zimbabwe has undoubtedly started to improve under the new unity government's watch. But politically, things remain very murky. The EU raised concerns about continuing human-rights violations, the arrest and harassment of MDC MPs, the rule of law, governance, property rights and the media. Although the EU is already spending some $90m a year on humanitarian and development projects here, far bigger sums will not be forthcoming until the political climate improves. After their talks, President Mugabe seemed to acknowledge that the power-sharing agreement was not always being conducted in the right "spirit" but he insisted these were minor issues and that "we have done everything we've been asked to do under the GPA". So what happens now? This visit was never likely to produce any major breakthrough. Instead the EU is talking of its determination to show "flexibility" in what will, inevitably, by a long and difficult process of re-engagement. After the delegation had left State House, President Mugabe turned and strolled back inside, past the two stuffed lions. Standing in a scrum of journalists on the red carpet, I asked him if he felt any responsibility for all Zimbabwe's troubles. He shook his head. And did he have any plans to retire? "That is a regime change question," he said to loud laughter. "I am still young."